It seems that the next season of the hit telenovela "The Boston Celtics" has been picked up by the NBA. I say that in jest, but with the events of the last year being what they have been, comparison to often over-dramatic Mexican version of soap operas (which are already dramatic) is pretty spot on. Sometimes, it's been entertaining, but other times - like today - it just makes me want to change the channel. 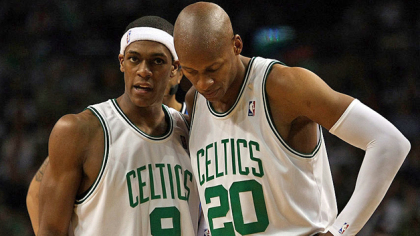 I am referring to Rajon Rondo signaling that the rift between the 2007-08 title team have finally put their feud to bed. Our regular readers know I am a UConn homer (please, let's not dive into their recent play), but they also know I am, shall we say, less than enamored with how Ray Allen has handled himself of late on several levels. Despite not being as angry as some of you over his departure, the lack of concern for his teammates and conduct suggesting a particular speech he was given as an actor might have been better heeded have combined to lower my estimation of the man as a person if not a player. I'm over it, and I think most of us are. I'm glad Ray and the crew can hang again. I genuinely hope they have a fun time on vacation. I'm glad Isaiah Thomas and Paul Pierce are not going to have to share tribute nights. They both gave more than I likely ever will give a job, and deserve it. I'm not here to debate who gave more, it's not even close. I'm not here to tell you things you don't care about, either, but sometimes covering the current and former Celtics requires we do so anyhow, so I'm being honest in this article. I really am happier when the players can get along. I have to cover a lot of stuff I personally am as over as most of you are, and I don't like arguing about what is really closer to something out of "Una Familia Con Suerte" or "As the World Turns" than the 2008 (or 2018) NBA Finals. It comes with the job, though, and sure, it's important enough that we have to give it coverage. I'm not going to pretend this is especially relevant to what happened last night and certainly not yesterday afternoon, but these rifts do impact the overall strength and image of the franchise in the court of public opinion. Now, let's get back to time healing wounds and such, and turn our attention to the second half of this season with this team. I'm sure I'm not the only one who feels that way, either.